Sleep Genius With Alarm is a mobile-based program that is intended to reinforce natural sleep rhythms using repeated musical patterns/rhythms during night-time sleep. The program utilizes neuroscience to help users with different types of sleep difficulties, including falling asleep, maintaining sleep, and awakening. 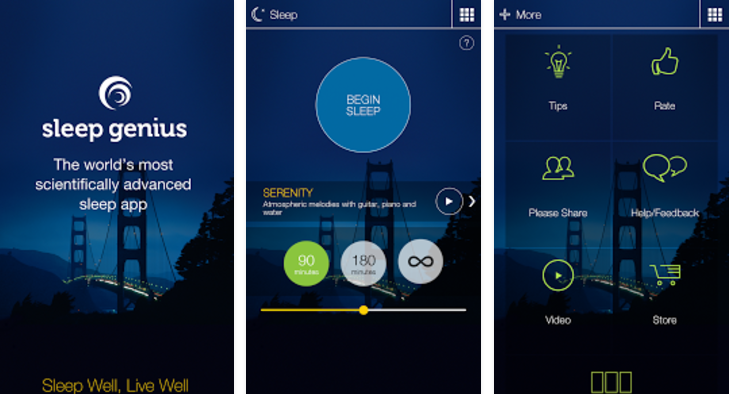 The free version includes one soundscape (a musical piece) designed to help users fall asleep, stay asleep, and wake up gently and progressively. Users are requested to open the app 15 minutes prior to their intended bedtime, set a wake-up alarm, and then listen to the soundscape to help them fall asleep. Although the soundscape is meant to play throughout the night, users have the option to set a timer to stop it. The Revive Cycle Alarm gradually awakens the user from any sleep stage with soothing sounds, micro phases, and volume shifts over a short period of 5 minutes. Additional features in the paid version include 3 additional sleep programs with different soundscapes; “The Power Nap”, which is designed to enable users to take 30-minute naps during the day (and wake up feeling refreshed); a daytime relaxation routine; recording of sleep patterns; and personalized weekly reports on sleep quality, quantity, and schedule sent via email.